I was carrying Truman through the office on the first floor to bring him out to the aviary when suddenly he took flight. He flew to the back but seeing no place to land and the wall coming up awfully quick, he turned around and flew the other way. He zoomed past me and continued toward the front. I wasn't worried and figured he would turn around once more and come back to me. But instead he slammed straight into the large front window at high speed. He bounced off the glass with a loud thud, fell onto the chair below and then resumed flight once more. He flew toward me but quite low this time and landed on my hand while catching his breath. 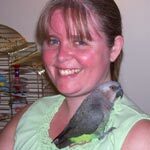 Truman had never once flown in that space before and I had carried him through on my hand without any restraint or trouble many times. I was surprised that he flew off because there was no loud noise or anything startling that I could think of. 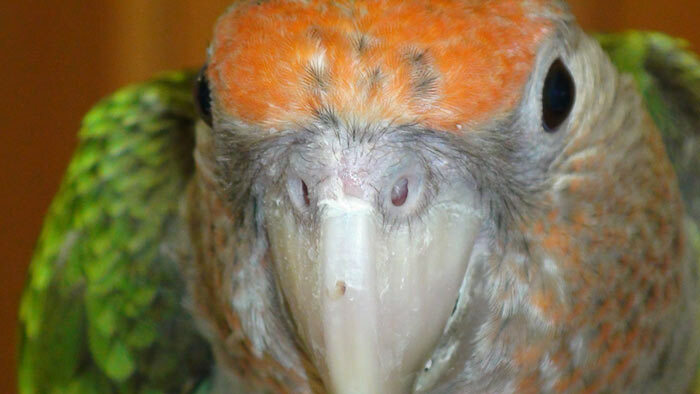 Kili on the other hand had flown in the space before and she always avoided the window. I guess Truman learned to avoid windows by seeing the framing of the window rather than generalizing it to the properties of glass. Well hopefully this will be a lesson learned for him that will carry on for life. I had already been pondering whether or not to bring Truman in for a followup vet visit about his leg injury. His recovery has been a roller coaster the whole way. At times I will notice improvement and then he may get even worse until there is any new improvement. A few weeks back I was seeing a lot of improvement so I decided to move him back to his cage. But for nearly two weeks since moving him to the cage he had not been getting any better. At times he even seemed to be standing worse. I even ended up calling the breeder and telling her that I am worried because he stopped getting better even a month and a half since the injury. Finally in the recent most days Truman had exhibited a big step in recovery. He was standing better and walking with less of a limp. On occasion I even caught him standing on one leg scratching and that was the bad leg he was putting all the weight on. When he crashed into the window, my absolute biggest concern was about him hurting his leg again but luckily the leg took no impact and was unaffected. I decided that this was as good a time as any to bring him in for a followup exam, not only to check the leg but also to verify no damage from the new crash. Other than scraped skin between his nostrils, I did not notice any damage or trouble with Truman. Nonetheless, I had already made an appointment and wanted to make sure. I brought Truman to the vet's office by subway and had him examined. He was really upset because they toweled him. He is much more used to hands but I never really bothered toweling him so it was stressing him out. 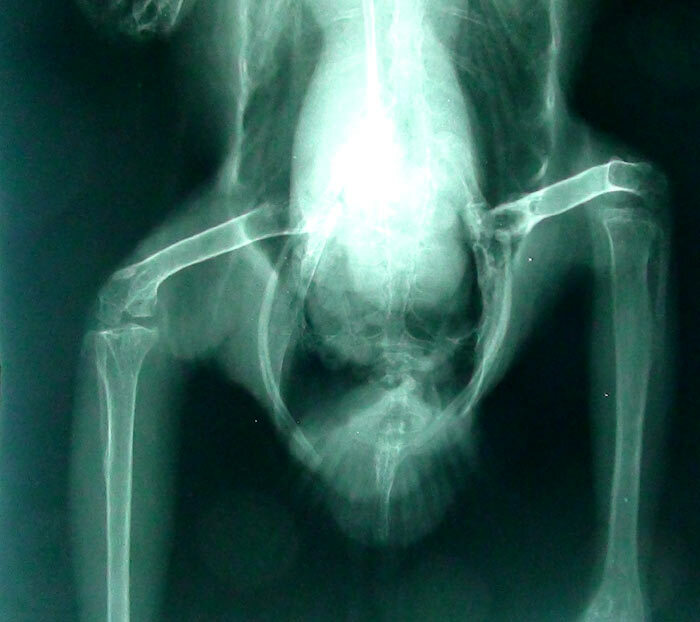 Upon preliminary examination, the vet noticed tightness in the bad leg but said it appeared good otherwise. She recommended an xray and I said to proceed but only as long as they do not put Truman under anesthesia. I do not believe the risk of complications from anesthesia outweigh the importance of a confirmation xray when substantial behavioral improvement had already been observed. Interestingly, this was the first time that Truman had demonstrated any sort of bond or preference for me. Previously he was always friendly to any people and pretty indifferent to me vs others. However, today he twice flew from people at the vet's office to my hand. Add two points to negative reinforcement based recall training! The previous times I had taken him to the avian vet, he had no even so much as tried to fly. This time he flew once on top of another bird's cage and then twice back to me from other people. Upon examination of the xrays, the vet stated that the bone has healed and suggested more exercise and physical therapy for the bad leg. Otherwise, there is nothing more that can be done. This third and final vet visit for Truman ended up running $165 which brings the total cost of all of his treatment to $1044 (though $247 was refunded). On the subway ride back from the vet, Truman was extremely sleepy. Despite all the noise and swinging, Truman slept through the whole ride back. I noticed that every time I take Truman back from the vet that he is abnormally sleepy. Last time I thought it was the result of blood loss from samples and injections, but this time there was no blood work of any kind. At this point I can only suspect that the exhaustion is either from stress or from the fumes. They had rubbed him down with alcohol both times and I'm uncertain if that could be the cause of the sleepiness. So the good news is that Truman's bone has healed and it's just a matter of recovering his muscles back to normal shape. As for the crash into the window, except for a minor scrape he has come out of it unharmed. 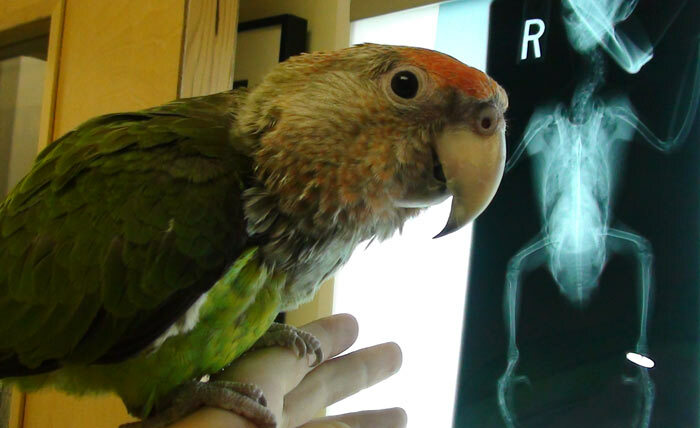 Must say I love the picture of Truman with the Xray in the background! Now that's a money shot Good to hear he is well on the way to recover. I don't know how much more I can take of this. I find myself now sobbing uncontrollably. I'm so scared to open up emails from you at this moment. I caught the last line that Truman seems to be doing better and the window crash didn't do too much damage, but honestly, I find myself too attached to Truman and so fearful of his health. Please go so slowly with him until he's fully recovered. I'm sorry to write this - I do admire you. I agree that composition of the photo of Truman with the x-ray is eye-catching, and the caption is perfect. Actually amusing. Good advertising photo for the vet - guess they wouldn't give you a discount in return for its use. 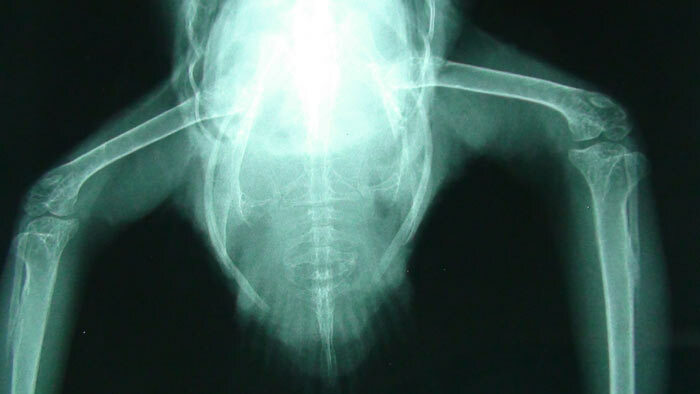 I've not had a bird x-rayed before. How did they position Truman to get the view? 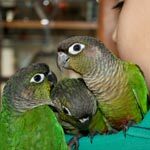 So now you will have to share with us your avian physical therapy techniques. Such a great educational site you have created! Glad to hear he's doing better! Great pic of him marveling at his xray! Good to hear he is fully mended and able to continue the normal routine Now Kili's moult needs to finish and it will all be back to normal! Very happy to hear that Truman is well on the road to recovery. He sure gave you and a lot of people on this message board (and on the internet I'm sure) a good scare. Here's hoping things calm down for you and Truman and you can get back to training him and enjoying each other's companionship.